Hyperglycemia is the condition in which blood sugar levels in the blood are abnormally high, that is are at levels above 150 mg/dL a few hours after eating. The cause of hyperglycemia in children and adults is usually uncontrolled or poorly controlled diabetes. However, there are other causes of hyperglycemia, including inflammation of the pancreas. Hyperglycemia can also be caused by certain medications and the presence of certain tumors in the body. Neonates can also suffer from hyperglycemia, which can be due to hypoxia, sepsis or premature delivery. The symptoms of hyperglycemia are excessive thirst, frequent urination, weight loss and nausea, vision problems, and fatigue. Hyperglycemia is usually treated with insulin. In the case of diabetes, individuals may need to take insulin injections or medication to lower the blood sugar. This is more often the case in type 1 diabetes. Type 2 diabetes can often be treated by people losing weight, changing their diet and exercising. If the cause of hyperglycemia is not diabetes, then treatment should also include treating the underlying condition, for instance removing tumors or treating pancreatitis. In some cases blood sugar needs to be monitored but in other cases it does not. It will often depend on the cause of the hyperglycemia. High blood sugar can have devastating effects on multiple organs, leading to loss of vision, kidney failure, heart disease and nerve damage. High blood sugar in diabetics can lead to sores on extremities, which can easily become infected, requiring amputation. Diabetes is a disease in which insulin is either not produced by the pancreas, or the body cells become resistant to insulin and as a result blood sugar (glucose) levels are not properly regulated. Diabetes can be caused by autoimmune disease (type 1 diabetes), or in some cases, from being overweight, having unhealthy eating habits and lack of exercise (type 2 diabetes). Gestational diabetes can occur as a complication of pregnancy. In type 1 diabetes the cells of the pancreas that produce insulin may be damaged due to an autoimmune response. This means that no insulin is produced. In type 2 diabetes insulin is still produced but the cells of the body have developed resistance to the insulin and do not respond properly. The symptoms of diabetes are excessive thirst, frequent urination, vision problems, fatigue, weight loss, extreme hunger, nausea, fruity-smelling breath, dry skin, abdominal pain, rapid breathing, and shortness of breath. In poorly controlled diabetes, patients can experience both hyperglycemia and hypoglycemia (blood sugar that is too low), which means they can have symptoms of hypoglycemia as well. Treatment method often depends on what type of diabetes you have. Type 1 diabetics almost always have to take insulin injections along with a change in diet and exercise. Type 2 diabetics can often control their diabetes by simply losing weight, changing their diet and exercising more. Gestational diabetes is treated with a healthy diet and exercise. Sometimes insulin is still needed by people with type 2 and gestational diabetes. Diabetics always need monitoring of their blood sugar levels. Many of the complications result from the high blood sugar, which can have devastating effects on multiple organs. Diabetes can lead to nerve damage resulting in paralysis. It can also cause loss of vision, heart disease and kidney failure. Diabetics can develop sores and ulcers on extremities that become infected, sometimes requiring amputation. Ketoacidosis can occur in diabetes, which can result in coma and even death. Ketoacidosis occurs because a lack of insulin means that the body cannot break down sugars to release energy and thus breaks down fats, producing ketones that can be detected in the blood. Ketoacidosis can cause nausea, mental confusion and dehydration. Diabetics can also suffer from hypoglycemia if they accidentally take too much insulin. This can also result in coma and death if untreated. 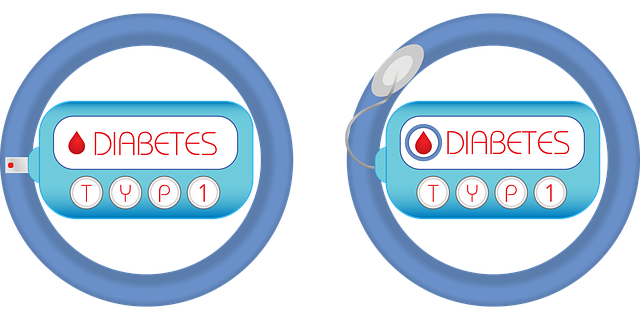 Hyperglycemia is unusually high blood sugar levels, while diabetes is a disease in which hyperglycemia is a symptom of poorly regulated blood sugar. Hyperglycemia can be caused by diabetes, pancreatitis, tumors, and neonatal problems. Diabetes can be caused by autoimmune problems or an unhealthy diet and lack of exercise. Hyperglycemia symptoms are excessive thirst, frequent urination, weight loss and nausea, vision problems, and fatigue. Diabetes symptoms are excessive thirst, frequent urination, fatigue, weight loss, extreme hunger, vision problems, fruity breath, nausea, dry skin, abdominal pain, rapid breathing and shortness of breath. Long-term monitoring of blood sugar may or may not be needed for hyperglycemia but it is always needed for diabetes. 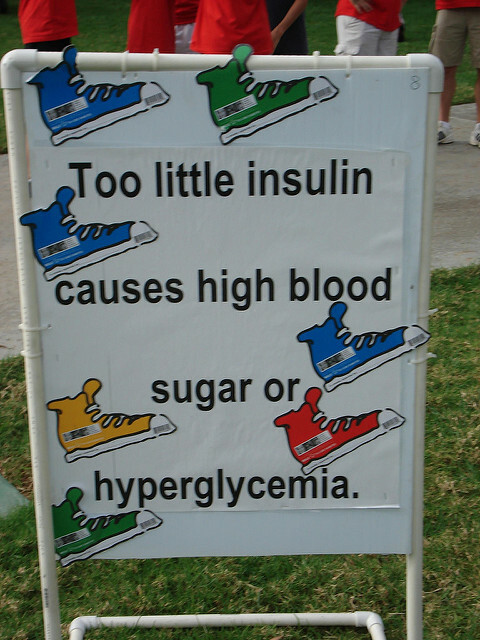 Hyperglycemia can cause nerve damage and damage to several organs. Diabetes has similar complications but can also result in ketoacidosis, hypoglycemia, coma and death. Hyperglycemia is a condition where blood sugar levels are higher than usual. 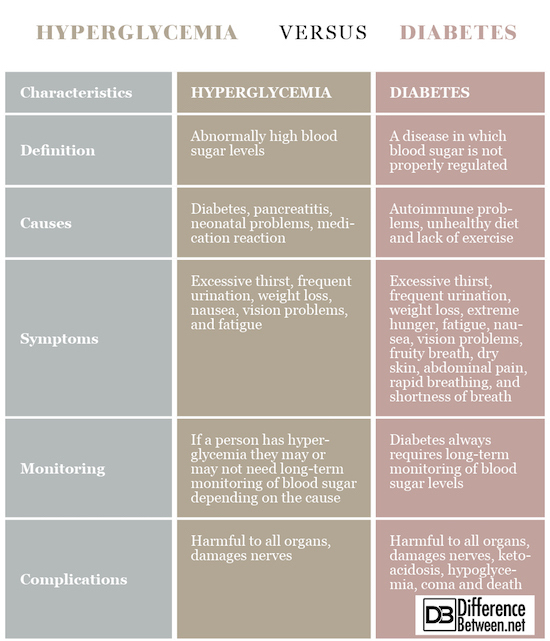 Causes of hyperglycemia include diabetes, but also pancreatitis, tumors and neonatal problems. Diabetes is a disease in which hyperglycemia is a symptom and can be caused by autoimmune problems or in some cases, an unhealthy lifestyle. Both hyperglycemia and diabetes may need to be treated with insulin injections. Both diabetes and hyperglycemia can damage organs in the body. Dr. Rae Osborn. "Difference Between Hyperglycemia and Diabetes." DifferenceBetween.net. May 22, 2018 < http://www.differencebetween.net/science/health/difference-between-hyperglycemia-and-diabetes/ >.